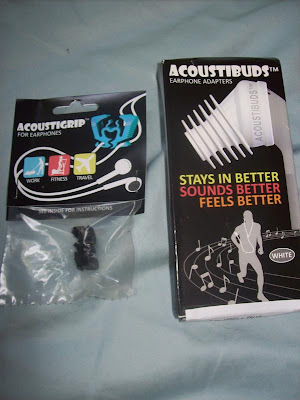 Acoustibuds sent me some of their earphone adapters for review along with some Acoustigrips. I gave these items to my husband to test out because he is a runner. He LOVED the Acoustibuds because it helped to keep the headphones in his ears. These come in different sizes which is awesome since people have different sized ears. These can be purchased online or at many different stores. Also, all of these products are made in the United States! The Acoustigrips are "an earphone cord management clip that attaches to the wires of your earphones. ACOUSTIGRIP™ is used to clip the earphone wires to a shirt or light weight jacket. This allows the consumer to perfectly set the wire slack so that the earphones do not tug on the ears with head movement or when the wire ‘swings’ during exercise activities." These are great for athletes and runners! Giveaway will be for a set of ACOUSTIBUDS and ACOUSTIGRIPS $29.98 to four lucky winners! Each package contains 1 pair of all 3 sizes of ACOUSTIBUDS® and 2 ACOUSTIGRIP™. US and Canada only please! -Like Acoustibuds on Facebook (1 entry). -Follow Acoustibuds on Twitter (1 entry). I like Acoustibuds on Facebook. I am following acoustibuds on Twitter. Saw your request on GFC...so I am coming by to follow. Would love it if you returned the favour over at The Things We Find Inside whenever you get a moment. I would use it when running with the stoller. I entered your Alex and Ani Zodiac Bracelet (9/2) giveaway. I entered your V9DT Pet Travel Harness (8/31) giveaway. I entered your Evoraplus Probiotic Mints (8/30) giveaway. I entered your Avitae Caffeinated Water Giveaway (8/30) giveaway. I entered your Zehn Naturals T-shirt Giveaway (8/29) giveaway. I entered your $32 Neostrata Foaming Face Wash- FIVE Winners (8/28) giveaway. I entered your Lipo in a Box Giveaway- 2 Winners (8/28) giveaway. I entered your Cafe Don Pablo Coffee- 2 Winners (8/26) giveaway. Oh man! My earphone JUST went out (well the left one did) so I need these badly! Regular earbuds just don't stay in for me! I run 3-4 times a week and I like ones that STAY PUT! I follow Acoustibuds on twitter. I would use these when I travel via plane or am waiting at the airport. I found your site a long time ago and have followed ever since. 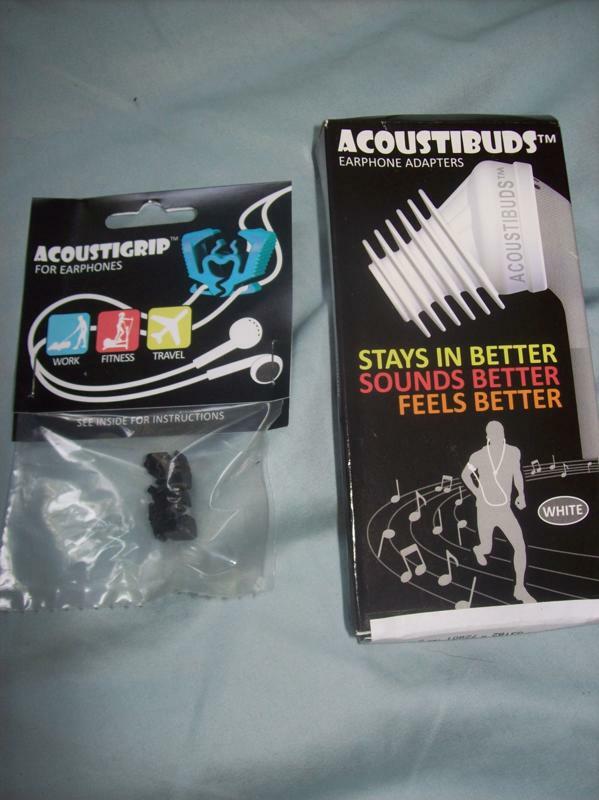 I'd use the Acousibuds/Acoustigrips mainly for running, and maybe walking too. I subscribe to your blog :-). I found you after you commented on my blog. I'd use them for running! I think I found out about your blog through someone else's? I would use them when I am out and about. My other earphones don't like to stay in my ears. I like acoustibuds on FB. Found your blog after you left a comment on mine. I'd use them when jogging outside. I will use this for running or walking either outside or on my treadmill. This will give me an excuse to get an ipod. I find music gives my wayyyy more motivation. I found you by sweepstakes advantage and I am very glad I found your blog. Entered the V9DT Pet Travel Harness giveaway! I would love a pair of these. I'm a runner and the current pair I have are a bit annoying, so I would use these when I run and hope they would work much better.